External drives may be the most common way to increase a Mac's data storage capability, but they can do more than just provide extra space. External drives are versatile, both in how they can be used, and the types of drives and form factors that are available. In this guide, we're going to look at the various types of external drives, how they connect to a Mac, and which type might be the best fit for you. We're going to include a wide variety of external devices in this category, from small USB flash drives, which can serve as temporary storage or as a permanent home for apps and data that you need to carry with you, to large drive arrays that hold multiple storage devices in one case. USB flash drive: Small and portable, with practical sizes ranging from 2 GB to 128 GB. Yes, there are both smaller and larger sizes, but the smaller sizes aren't very practical, and the prices for the larger ones are astronomical. Flash drives can be slow, especially when you're writing data to them, so they're not a great choice for storing data that changes frequently. 1.8-inch external enclosure: Designed to hold a single 1.8-inch form factor hard drive or SSD. Power is usually supplied by the interface bus (USB or FireWire), but some enclosures also use an external power supply (wall wart). This type of enclosure should perform as well as any other external device that uses the same type of computer interface. 2.5-inch external enclosure: Designed for use with the types of hard drives commonly seen in laptop computers; they can also be used to house an SSD. Performance is dependent mostly on the type of external interface used to connect the enclosure to the Mac. Common interface options include USB 2, USB 3, and eSATA. The enclosures can be bus powered or have their own power supplies. 3.5-inch external enclosure: Used with the standard hard drives found in most desktop computers. They can also be used with SSDs; in some cases, two SSDs can be installed in this enclosure size. External interfaces include USB 2, USB 3, FireWire, eSATA, and Thunderbolt. This type of enclosure usually has its own power supply. Multi-bay enclosures: This type of enclosure uses multiple bays or docks. Each bay supports a single drive. Multi-bay enclosures range from holding two drives to holding 16 or more drives. They usually hold 3.5-inch drives, but many also support SSDs. The external interfaces available include USB 2, USB 3, FireWire, eSATA (and other SATA types), and Thunderbolt. Each bay may have its own external interface, or the drives may be routed through a RAID controller and presented to the Mac using a single interface. Of the interfaces mentioned, only eSATA hasn't made an appearance on a Mac as a built-in interface. Third-party eSATA cards are available for the Mac Pro and the 17-inch MacBook Pro, using the ExpressCard/34 expansion slot. USB 2 was the most common interface, but USB 3 is catching up; nearly every new external enclosure offers USB 3 as an interface option. That's a good thing because USB 3 offers performance that far surpasses its predecessor, as well as both FireWire interfaces. Even better, there's very little, if any, price premium for USB 3 devices. If you're considering a new USB-based device, go with an external device that supports USB 3. When looking for a USB 3-based external enclosure, keep an eye out for one that supports USB Attached SCSI, often abbreviated as UAS or UASP. UAS makes use of the SCSI (Small Computer System Interface) commands, which support SATA native command queuing and separation of transfer types into their own data pipes. While UAS doesn't change the speed at which USB 3 runs, it makes the process much more efficient, allowing more data to be sent to and from an enclosure in any given time frame. OS X Mountain Lion and later include support for UAS external enclosures, and the time spent to find enclosures that support UAS is worthwhile, especially for ones that will contain either an SSD or multiple drives. If you're looking for optimal performance, then Thunderbolt or eSATA is the way to go. Thunderbolt has an overall performance advantage and can support multiple drives with a single Thunderbolt connection. 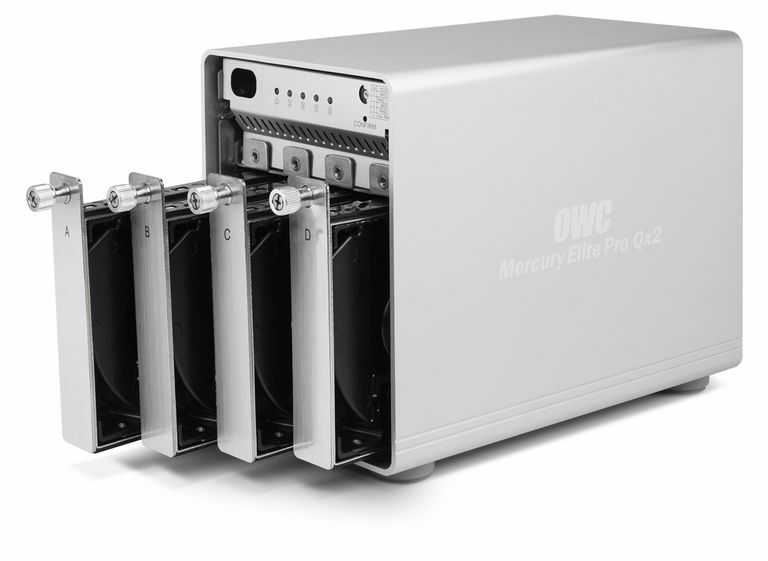 This makes Thunderbolt an attractive choice for multi-bay enclosures that contain multiple drives. You can purchase external cases that are pre-populated with one or more drives, or empty cases that require you to supply and install the drive(s). Both types of cases have their advantages and disadvantages. Pre-built externals come completely assembled with the drive size you specify. They include a warranty that covers the case, drive, cables, and power supply. All you need to do is plug the external into your Mac, format the drive, and you're ready to go. Pre-built externals can cost more than a DIY external case, which is supplied without any drives. But if you don't already have a drive on hand, the cost of buying an empty case and a new drive can come close to, and in a few instances, exceed the cost of a pre-built external. A pre-built external is ideal if you just want to plug in a drive and go. DIY, on the other hand, generally provides more options. There are more choices in case styles, and more choices in the type and number of external interfaces they may have. You also get to choose the size and make of the drive. Depending on the drive manufacturer and the model you choose, the warranty period for the drive may be much longer than for a pre-built model. In some cases (no pun intended), the warranty for a DIY model can be up to 5 years, vs. 1 year or less for some pre-built models. The cost of a DIY external can be much less than a pre-built if you're repurposing a drive you already own. If you upgrade a drive in your Mac, for example, you can use the old drive in an external DIY case. That's a great use of the older drive and a real cost saver. On the other hand, if you're purchasing both a new DIY case and a new drive, you can easily exceed the cost of a pre-built. But you're probably getting a larger and/or higher performance drive, or a longer warranty. The uses for an external drive can range from the mundane, but oh-so-important backup or Time Machine drive, to high-performance RAID arrays for multimedia production. You can use an external drive for just about anything. Popular uses for external drives include dedicated iTunes libraries, photo libraries, and home folders for user accounts. In fact, the last option is a very popular one, especially if you have a smallish SSD as your startup drive. Many Mac users with this configuration quickly outgrow the available space on the SSD. They alleviate the problem by moving their home folder to a second drive, in many cases, an external drive. So, Which is Best: DIY or Pre-Built? Neither option is hands-down better than the other. It's a matter of what meets your needs; it's also a matter of your skills and interest level. I like to reuse old drives from Macs that we've upgraded, so for me, the DIY external enclosure is a no-brainer. There's no end to the uses we manage to find for old drives. I also like to tinker, and I like to customize our Macs, so again, for me, DIY is the way to go. If you need external storage, but you don't have any spare drives on hand, or you're just not a do-it-yourselfer (and there's nothing wrong with that), then a pre-built external may be the best choice for you. No matter which way you go, a pre-built or a DIY external, I highly recommend buying an enclosure that has multiple external interfaces. At a minimum, it should support USB 2 and USB 3. (Some devices have separate USB 2 and USB 3 ports; some devices have USB 3 ports that also support USB 2.) Even if your current Mac doesn't support USB 3, chances are your next Mac, or even a PC, will have USB 3 built in. If you need maximum performance, look for a case with a Thunderbolt interface.